Fluorescent light fixture repair needs to occur when the light fixture begins to make buzzing sounds or flicker, or you notice the ballast leaking a tar-like substance. This typically occurs with an older ballast. When replacing a fluorescent light fixture ballast, you may want to consider switching from the older style T12 magnetic ballast to a more energy efficient T8 ballast. This is a simple swap, and will give you a light fixture that is quiet, does not flicker, has a longer lifespan, and will save you money over time. Changing fluorescent light fixture ballasts is a simple process, and can easily be tacked by a diyer if all safety precautions are followed. Never work on a live circuit – make sure the breaker is off, and test this with a voltage tester or multi meter. This is a short, but informative video clip from a national television show that I appeared in several years ago. I served as the electrical expert, and answered live calls from people across the country. In this clip, a caller was experiencing a problem with fluorescent light fixtures in the home. 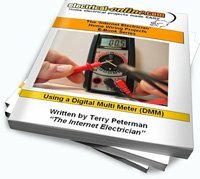 I’ll follow up this video with a detailed article covering this simple home electrical wiring project. This entry was posted in Electrical Wiring, How-To-Videos and tagged ballast, diy, diy project, electronic ballast, fluorescent, fluorescent light fixture, home electrical wiring project, light fixture, magnetic ballast, T12, T8. Bookmark the permalink.